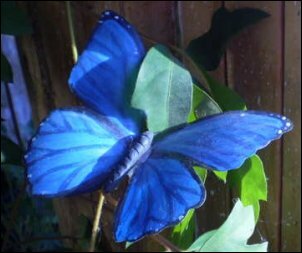 Learn how to make beautiful, realistic butterflies from old plastic bottles. 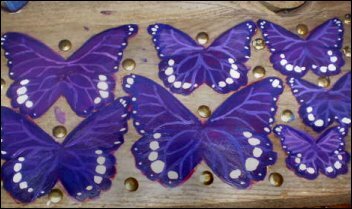 The curve of the bottle will make the wings of the butterfly look realistic, and by using acrylic paint you can make any kind of butterfly you want, real or whimsical! 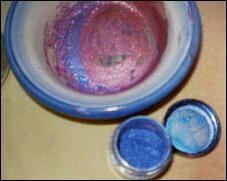 ♥ Pearl Ex-which is a mica-based powder that makes the wings shimmer! To prepare your bottle for being turned into a butterfly, first wash the label off. I do this by soaking it in my sink with some dish detergent, and then picking any bits off that don't come right off. If there is still a thin strip of gluey goo stuff, don't worry about it. 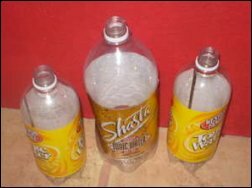 Cut around the top of the bottle to get the top off. All you want to use is the straight part of the bottle - no curves. Do the same to the bottom. As soon as you have a cylinder of plastic, cut down the side with the gluey goo to create a rectangle of plastic. You have to sand the plastic so that your paint will stick to it well. The side you will sand is the side that was on the outside of the bottle. I use 220 grit and sand in a circular motion until the bottle appears "frosted" or matte. You can also work to 400 grit, but I only use 220 because I want my bottle to be rougher, so that the paint sticks better. You will need to figure out what kind of butterfly you want to paint. I just Google imaged pictures of butterflies to get ideas. There are some incredible tropical butterflies out there! 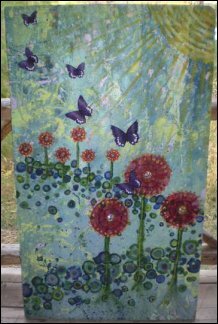 I have also made local butterflies, such as monarchs, as well. 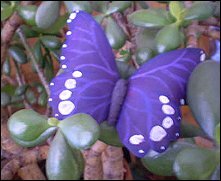 Once you get an idea of what kind of butterfly you want, print out some pictures of them. 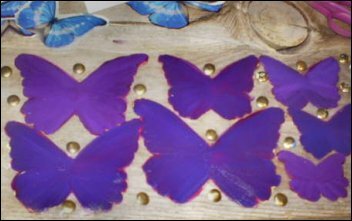 Then cut out the outline of the butterflies, and trace them onto your plastic with a permanent marker, making sure that they are set up so that the tips of the wings are parallel to the top of the plastic, so that when you fold the wings, they wont be all funny! (see picture) To trace easily, weigh the ends of the plastic down with something heavy. 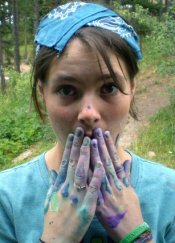 Now you will paint a base layer for your butterfly. If you have gel acrylic medium (matte), paint it on first. Your brush strokes should always go from the center of the butterfly out towards the wings. Let this layer dry before moving on. Base layer: You will want a base layer to block some light and make a better surface to paint on. I suggest using a light color of paint, because white is a colloid and will look more solid. If you know the color of the bottom of the butterfly's wings that you want to paint, go ahead and use that color. Again, brush from the center to the wings, but stay inside the lines! Some practice will make you better at this. Look at the picture of your butterfly, and paint the butterfly on your plastic with that color. If your butterfly is 2 colors, like a monarch, paint it the lighter color (It's easier to paint over). To really make your butterfly look good, you should add some details. Veins, in particular, really add to the finished effect. Use a very fine tipped paintbrush for your veins, and either a lighter tint or a darker shade of the color of your background to make the veins. 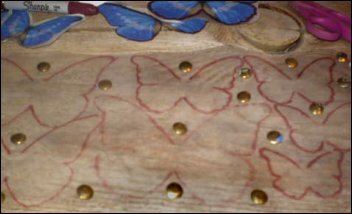 Since I'm doing whimsical butterflies for this example, I just put dots wherever I felt like it, but if you're painting a realistic butterfly, it's best to look at your picture as a guideline. Again, using a fine paintbrush will make your butterfly that much better! Look at your picture, and form a body like the one in the pic. I use a toothpick to add details like lines to it, but that's optional, depending on how realistic you want the butterfly to look. To make antennae, cut short lengths of the black wire and stick them in the body. To add eyes, use black seed beads and press them into the clay. You can also make eyes out of the clay as well. Fire your butterfly bodies. Most polymer clays bake at 275 degrees F, but check the temp and bake time just to be sure. If you want your butterfly to shimmer like some real butterflies do, use Pearlex powder to add some sheen. 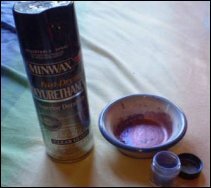 Take a clean paintbrush and make it damp, and dip it into the powder. Then, in careful strokes, add some sheen to your butterfly. 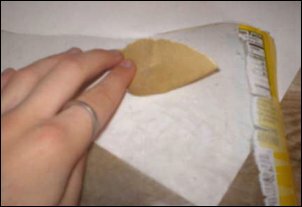 When your butterfly is dry, cut out the outline with sharp scissors. Then you need to spray them. I use oil based enamel spray to make them shiny, but if you don't want shine, you can use matte spray. DO NOT SPRAY THE BODIES!!! Oil based finishes and polymer clay react in such a way that the polymer clay just stays sticky and it's really annoying. When you get your butterflies sprayed, and they dry, you are ready for the last step: putting it all together. Use super glue or epoxy to glue the body to the area inside the wings. Ta Da!!! Lovely butterfly! ♥ Glue a loop of wire onto the back and make an ornament or a gift wrap tag. ♥ Glue a push-pin onto the back and make it a wall decoration - just push it wherever you want. ♥ Glue a dowel with a sharpened end to the back to make an awesome plant stake! ♥ Glue it onto a painting (what I usually do). It adds a great 3-D, whimsical touch. ♥ Glue it onto a picture frame. ♥ Glue a suction cup onto the back to make a window decoration! Your uses are limitless! Who knows what other wonderful ideas are out there?